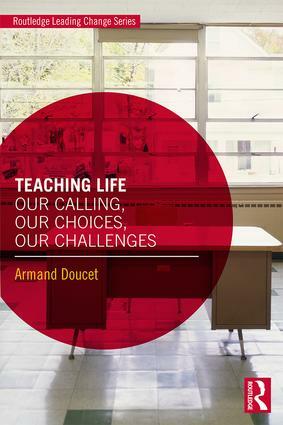 In this engaging book, Armand Doucet, a globally respected and recognized teacher, provides a clear roadmap for championing classroom-focused changein a technology-advanced society. Teaching Life brings the voices of teachers into the global conversation about educational reform to offer a how-to for implementing into classrooms design thinking, technology integration and a holistic education based on competencies, social-emotional learning and the literacies. With the innovative ideas in this book, educators can create a foundation for sustainable, honest, transparent leadership and work toward building a true community of local and global learning. "This book is a wonderful call that inspires teachers to innovate and feel proud of their profession, written by one of the most highly regarded teachers in the world. Clearly and beautifully written, Doucet’s book uplifts me as a leader of teachers and I am sure it will make every teacher who reads this work feel better about the truly honorable profession to which they dedicate their lives." "Doucet is a history teacher and he brings himself and his students to the whole wide world. In Teaching Life he shows how teaching can be a ticket to boundless imagination, and an energizing but focussed romp into learning about oneself and the world. Doucet has written a stimulating and compelling book to act and learn in concert." "Teaching Life is a passionate and engaging story of teaching. It is another must-read for anyone interested in championing classroom-focused change. It is a book that raises important questions about education as a new vision about more than simply preparing students for a technologically - advanced world, but also about how education can prepare them to embrace values such as equity, justice, peace and human rights." "An award-winning teacher, Doucet draws upon his own decades of work as a coach, teacher, leader, and his visits to classes across the globe to argue that education is the single most important social program for the long-term future success of any society. This timely and teacher-centered piece reminds us that a country that cannot think, is just as dangerous as a country that cannot defend itself." Chapter 2 – Profession or Occupation? Armand Doucet is one of the world’s foremost pracademics and teachers in education. He is a sought-after leader, inspirational speaker, coach, columnist and co-author of the best-selling book Teaching in the Fourth Industrial Revolution: Standing at the Precipice (Routledge 2018). Armand currently teachesModern History and World Issues in French Immersion at Riverview High School in the Anglophone East School District in New Brunswick, Canada.He has received the Governor General Award for Teaching Excellence in History (2017), Canadian Prime Minister’s Award for Teaching Excellence (2015), is a Meritorious Service Medal Recipient Governor General of Canada, is an Apple Distinguished Educator, Teach SDGs Ambassador and has recently been nominated in the Top 50 for the Global Teacher Prize.